Here are some happy, some bored, some bemused children at the Leaf Rapids Education Centre sometime close to the Christmas season in, perhaps, 1975, or perhaps '76, or perhaps '77; surely no later than that. 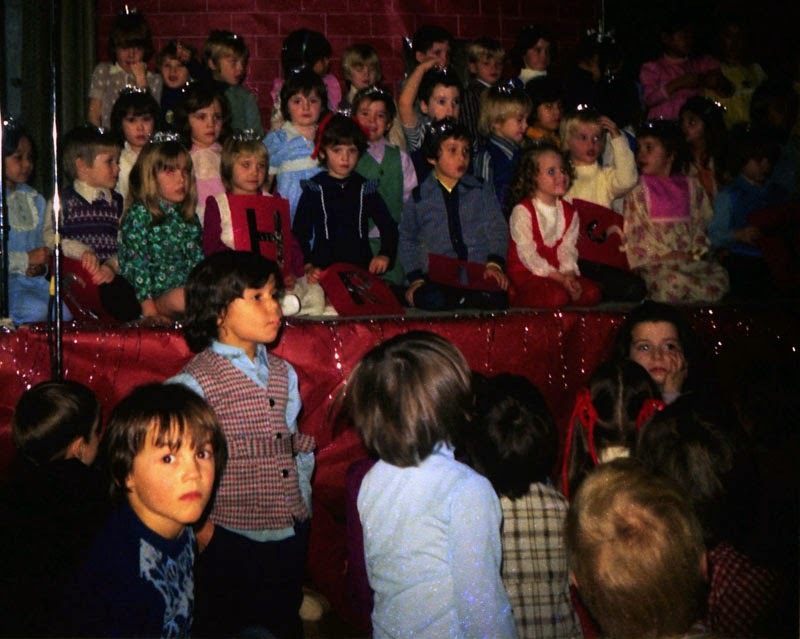 I recognize Melvin in the plaid vest and blue shirt standing in front of the stage, centre left, and I believe that's my cousin Carol Ann kneeling next to me on stage in the second row of children; I'm wearing the green vest, which I believe my mother sewed for me. Was this the year I portrayed the Wizard of Garbage in the play of the same name? I don't remember. I'm glad you've enjoyed my photos of Leaf Rapids. Thanks very much for commenting! Leaf Rapids was a magical place, and I still miss it sometimes despite those long, hard winters.